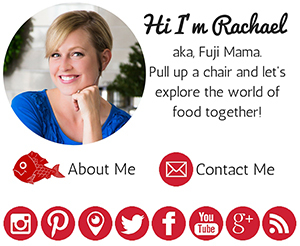 I am finally delivering on my promise to talk about seasoned vinegar (sushi-su) and sushi rice (sumeshi). Sushi rice, or rice dressed with a seasoned vinegar, is an essential component of a variety of sushi dishes. In fact, sushi wouldn’t be sushi without this rice. If you are serving slices of fresh uncooked fish without any sushi rice, you are serving sashimi! My experience is that semi-decent sushi can be ruined by bad sushi rice. 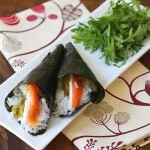 If you can make good sushi rice, there is no reason why you can’t make delicious sushi at home! Use polished (white) short-grain Japanese rice (japonica) or medium-grain California rice. These types of rice are often labeled as sushi rice or Calrose rice at the store here in the US. 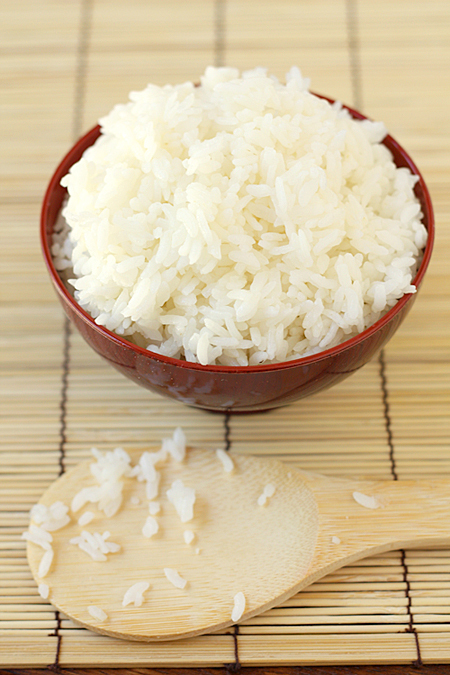 Wash your rice to get rid of the starchy powder that clings to the grains. This starchy powder will prevent proper absorption of the sushi-su and give you less than perfect rice. 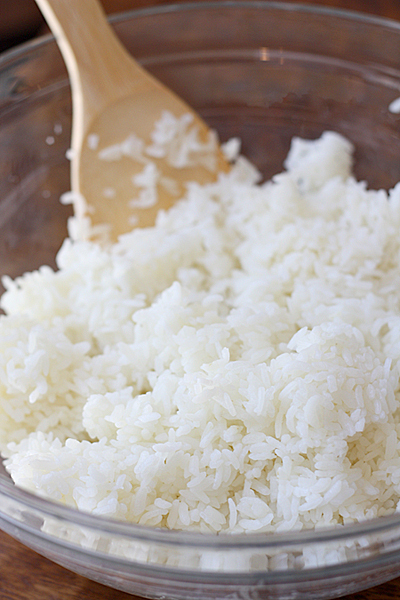 To wash rice, place your measured rice into a bowl and cover it with fresh cold water. Use your hand to swish and stir the rice around and then carefully drain the water (I use a fine-mesh strainer to do this). Repeat this process until the water runs clear. If you eat a lot of rice, a rice cooker is a wonderful investment because it eliminates timing problems, makes perfect rice, and many cookers offer a warming function that keeps rice fresh ahd warm for 24 hours. My favorite that I’ve personally used is Zojirushi’s Neuro Fuzzy Logic. But again, it’s an investment! It is best to mix the seasoned vinegar with the cooked rice in a sushi-oke or an unvarnished wooden bowl, but you can also use a wide shallow glass or ceramic bowl. I use a wide shallow glass mixing bowl, because that is what I have on hand. Do not, however, use an aluminum bowl, as this type of bowl will retain heat differently and give the rice a metallic taste. Prepared sushi rice should be stored at cool room temperature, covered with a moist cloth or plastic wrap. It will keep this way for up to 12 hours. Do not refrigerate it or freeze it, as this destroys the texture. There are many recipes for sushi-su (seasoned vinegar), but all use the same basic components: rice vinegar, sugar, and salt. Some recipes also through in a small piece of kombu, which adds more depth of flavor, but this is optional. I prefer my sushi-su to be not as sweet as some. Once you make your own, you can adjust the sugar to suit your personal taste! This recipe makes 1 cup of sushi-su. I like to make extra sushi-su so that I can use it as a salad dressing (you can add some sesame or olive oil, but I like it without). 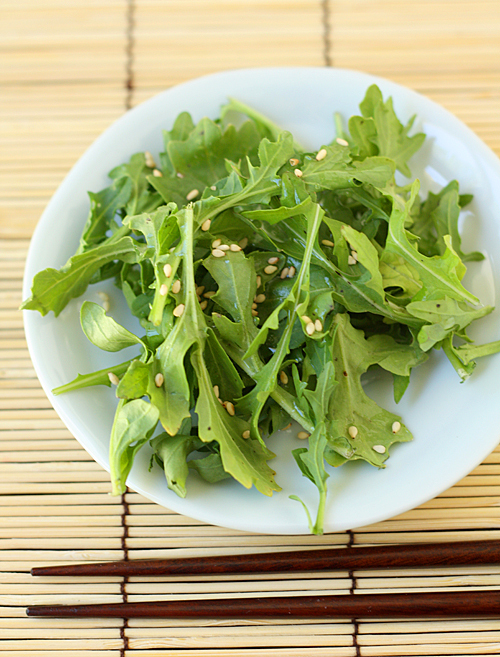 It is delicious tossed with baby arugula and then sprinkled with toasted sesame seeds. 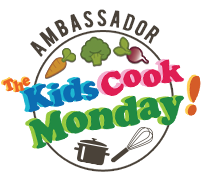 Combine the vinegar, sugar, salt, and kombu in a small saucepan. Place the saucepan over medium-high heat and cook, stirring until the sugar and salt dissolve. When the mixture is clear, remove the saucepan from the heat and set it aside to cool. Discard the piece of kombu. Sushi-su can be stored in an airtight container in the refrigerator for up to 1 month. 1. Transfer the freshly cooked hot rice to a wide shallow bowl. Pour a small amount of the sushi-su evenly over the rice. Toss the rice by gently cutting into it vertically with your rice paddle (or spatula), and then lifting the rice and turning it over. As you do this, fan the rice with a hand fan or piece of cardboard (or get someone to help you). Add more of the sushi-su and continue the cutting, folding, and fanning process. Fanning the rice facilitates quick cooling, which gelatinizes the surface of the rice and gives a glossy finish to the rice. Towards the end, taste the rice occasionally to decide how much of you sushi-su you want to add. 2. Cover the seasoned rice with a moist cloth or plastic wrap until ready to use. 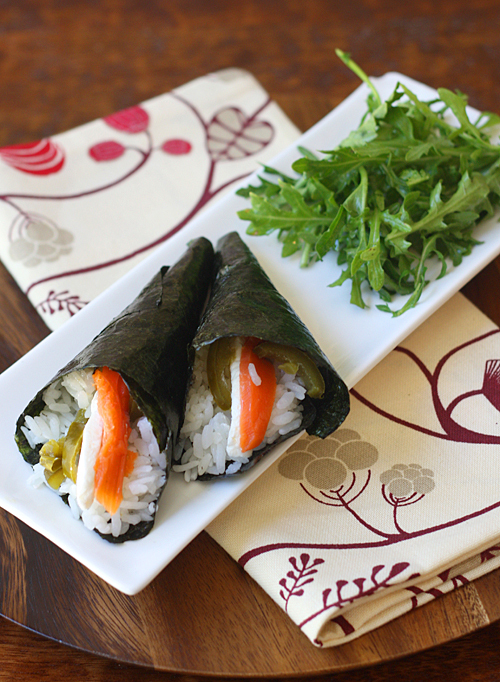 Now that you’ve got delicious sushi rice, you can start making sushi! See the blog Sushi Day for more yummy ideas! That looks beautiful!! nice and fluffy!! just the way I like my rice! Sounds good. I don’t like my sushi rice very sweet either. Haven’t made mine with kombu. I’ll have to try that and see what depth I’ve been missing…hehe! Wow that is amazing! I’ve always wanted to try making sushi at home but have been intimidated. Maybe now I’ll try it! Thanks for the tips! We make sushi all the time at our house. I usually just pour rice vinegar in the rice and toss it, but this sounds like a great recipe. I’ll have to give it a try. 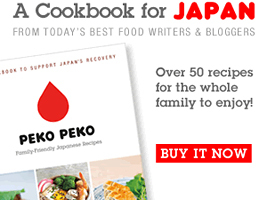 At last, we seem to be quite a few supporting the Japanese gastronomy the right way! I sooo needed this post! Awesome girl!! When are you opening up your own sushi shop?!! What a helpful and informative post! I’m a huge fan of sushi so I’m going to have to try out your tips and tricks! What a fab tutorial Rachael! Sushi is on my list of things to try this year and I have bookmarked this for reference!!! That rice looks wonderful! I could eat it plain :) I will have to re-read this post the next time I attempt to make rice (I say attempt because my rice always ends up turning into an epic kitchen disaster). This is very informative — thanks for all the tips! I love sushi rice, and I know it intimidates many people. What a wonderful post to take the fear out of making it at home! Okay, I’ve gotta try this again, using your step-by-step instructions. My son is a japonaphile, but we’ve never successfully made decent sushi, even after buying good rice at Uwajimaya. Thanks! I wonder if you can help me. I bought Mogami Sweet Rice (just rice, no added sugar) b/c I thought that’s what to use for sushi rice. It is a disaster. I’ve researched and tried many recipes but it always ends up a sticky, gooey, inedible mess. Right now I’m using it as pie weights for baking crusts but I wonder if there is a way to cook it successfully? I’ve soaked it, rinsed it, done everything I can think of and nothing works. Help! Mogami sweet rice is definitely different than the rice used to make sushi. The rice you have is probably the kind that is usually used for Thai dishes, like the sticky rice with mango dessert. Are you boiling the rice? Because that may be why its not turning out and becoming so gooey; with sticky rice you’re supposed to steam it. @Susan, What a bummer! Yes, Mogami Sweet Rice is different from sushi rice. Mogami sweet rice is a type of short-grained Asian rice that is especially sticky when cooked. Although other Asian rices become sticky to some extent, this type is especially sticky. Next time, when you are looking for Japanese rice/sushi rice, look for polished (white) short-grain Japanese rice (japonica) or medium-grain California rice. These types of rice are often labeled as sushi rice or Calrose rice here in the US. I hope that helps! Please let me know if you have any more questions! This is a fantastic post! You’re absolutely right – great sushi rice is an integral part of good sushi and now I’m excited to know how to make it properly. Oh. I needed this! I just bought stuff to make tempura roll. My rolls are okay. Ihave trouble with the rice…I hope this helps me out. THANKS! Those are some great tips for cooking rice. Rice is my most favorite thing to eat.I grew up eating lot of rice. Rice cooker is great option but if you don’t have rice cooker you can use your microwave to cook it. The trick is to soak it after washing for at least 30 or 45 mins. Ah! I was just wanting to know how to make sushi rice…! Thank you for this. Thank you for posting this! The texture of rice in the sushi is incredibly important. Awesome tutorial on how to make sushi rice! Hey, thanks for this awesome article. I don’t usually stick to a recipe but I think this set of directions will be my go-to from now on. I live in Japan and sometimes make sushi. But honestly…most people here in Japan just buy the stuff! Do not forget to fan like mad when letting the rice cool!!! That and use less water when steaming the rice! If you have a fancy rice cooker, use the sushi or curry rice cooking mode. Makes the rice harder, more al dente..and perfect texture for sushi! Great tips for making sushi rice! Some people think it’s hard to make but it really isn’t. Unbelievable recipe! How did you create it? I have tried something like that and I have to say that recipe is enough difficult, so you need not just simple rice cooker, maybe multicooker? I use Redmond 4500. Just because I’m not sure that your cooker is good. This is how I learned to make sushi rice while living in Japan. I use a Zojirushi rice cooker. I don’t think she created it, just researched it online or talked to a sushi chef, it’s a good basic recipe for the home cook, pro sushi chefs do it a little differently but ingredients are harder to find. Actually, this is the way I learned to make sushi rice during my years living in Japan. And I figured that I would share the method best suited for home cooks, like you said. Next post: Miso Pickled Garlic (Ninniku Miso-zuke)—All you need is 3 ingredients and a glass jar!